At Soma Pilates we offer training options to fit into your life and meet your goals. Are you new to Pilates? Do you like intensive, one-on-one training that is customized just for you? Does working out with others help you stay energized and motivated? Do you have minimal time in your already full day? We have choices that fit your aspirations, time and budget. We are experienced in working with injuries and other health concerns (pregnancy, MS, etc.). 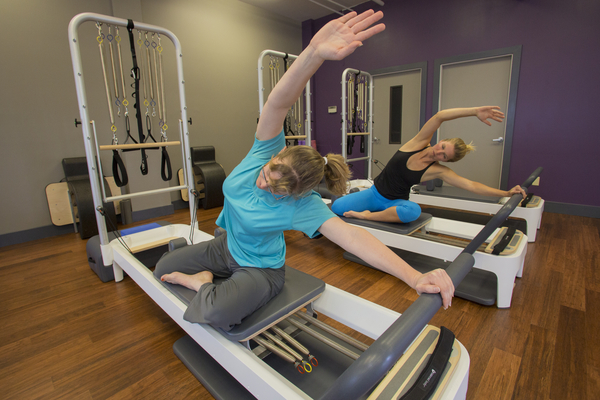 One of our studio’s specialties is transitional Pilates, taking you from post-rehab to resuming your usual level of performance. If you have a new injury, please start with your doctor or physical therapist. If you are looking for personalized training or dealing with an injury, Private and Semi-Private Sessions will give you the attention you deserve. During Private Sessions you work one-on-one with your instructor on a variety of equipment and the mat in a private studio space. If you are new to Pilates, this is the best place for beginners to start. Semi-Private Sessions are great for couples and friends that like to work out together. Each session is tailored to meet your needs, goals and preferences. Practiced regularly, they help you develop longer and leaner muscles, improve your posture, and increase your mind-body awareness. Small Group Training is drop-in sessions on a variety of equipment. You can make a reservation in advance, or drop in when it fits your schedule (as space is available). These sessions are limited to a maximum of 4-6 participants depending on the type of session. This category includes a variety of different types of sessions including Pilates Fundamentals, Reformer Training, Mat Training, Bodhi Suspension Training, Barre Training, MOTR Training, Pilates Mix, and Pilates Circuits. These workouts are designed to help you establish core strength and stability, get stronger and increase endurance, and improve mental focus. Modifications will be offered to accommodate different body types and levels of fitness. Workshops are offered to complement your Pilates training and grow your overall mind and body wellness. They are open to everyone in the community, not just clients. We are also an authorized training center for Balanced Body and currently offer instructor training for Pilates, Anatomy in 3 Dimensions, Balanced Body Barre, Bodhi Suspension Training, and MOTR training. Our upcoming teacher training schedule and sign-up are available through the the Balanced Body Education Finder. Are you new to Pilates or new to our studio? Come in and try us out for free! Find out more!